From the starship funk lead lines of the ‘70s to the gangster whine of mid ‘90s hip-hop, the ever-present MiniMg has been making its fat presence known for over 4 decades. The model of the Mini V knew an unparalleled success during the 1970’s. Artists and bands like Tangerine Dream, Kraftwerk, Depeche Mode, Keith Emerson, Jean-Michel Jarre, Klaus Schulze, and Rick Wakeman used the synthesizer, notably for the typical sound and its very warm quality, which is excellent for basses and lead sounds. 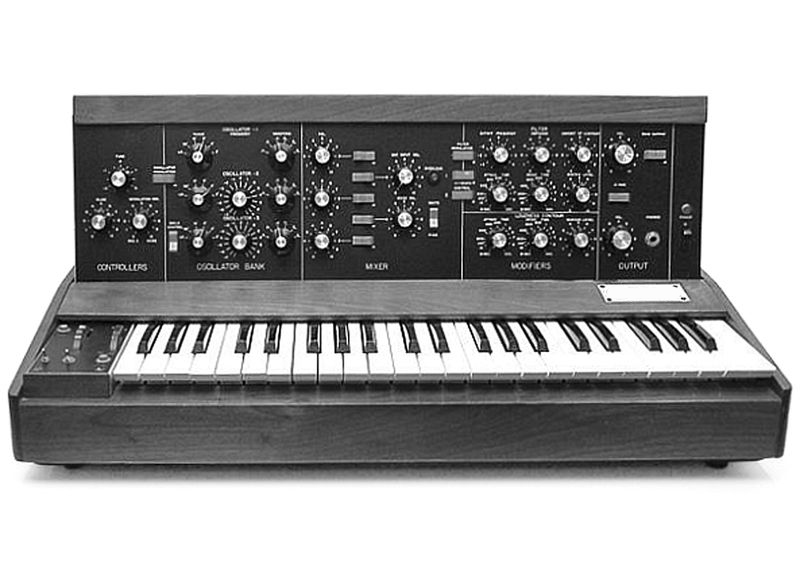 The very first prototype of this synth was called Model A. Three other versions, B, C and D, followed. This last model is the final and most common incarnation of this synthesizer and the only one that was put into production in large numbers. The choice of wood rather than plastic for the cabinet prevailed from the beginning, simply because Robert Moog preferred to follow the advice of his musician friends rather than the drawings coming from his industrial engineers. The original synth had particular characteristics for which it is loved by musicians even to this day. 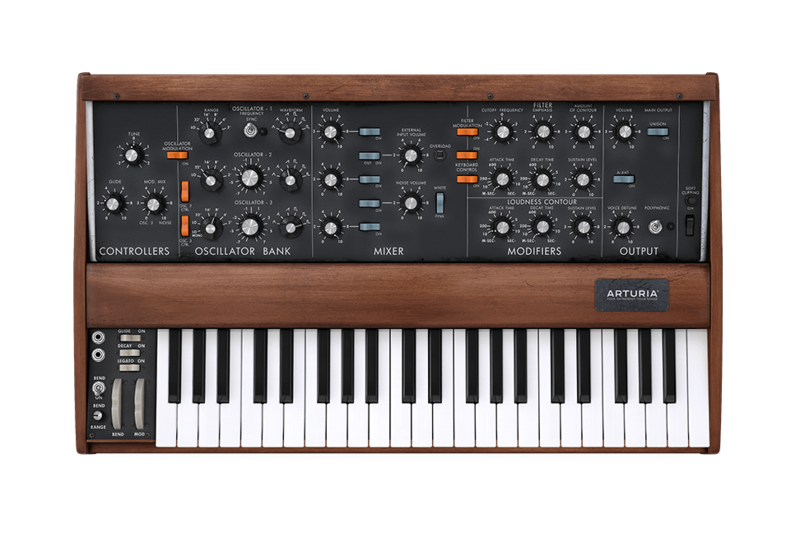 Arturia mini V brings back the sound and features of this beloved synth in a virtual instrument. We decided to recreate the legendary interface of the original because of its "vibe", a look and layout known and loved by generations of musicians. But what truly makes this synth the Legend of Legends is its sound, and so we took great care to recreate its internal characteristics as well. First, the oscillators. We recreate the exact characteristics of each oscillator, which have a very unique sound. And as with any discrete component analog oscillator, mini V produces "free-running" waveforms just like the physical circuits do. Secondly, the filter. Many digital filters have some characteristics which are very far from their analog counterparts. The mini V filter has the same characteristics as that of the original synth; i.e., its frequency and emphasis are completely independent. The mini V filter is a true emulation of the renowned 24dB/octave 4-pole filter. Another feature of the original filter is that the emphasis decreases when the cutoff frequency is low. This contributes a special character to the sound that lets the bass pass cleanly through the filter when playing lower notes. The soft-clipping behavior of the original synth’s amplification stages is also very important to the sound character, adding some intriguing harmonics and making basses sound more powerful. The second half has a deeper low end, is punchier and louder than the first half, yet with the same peak level. We have gone to great lengths to remain true to the original in this important aspect as well. While we were carefully modeling the characteristics of the sound, we also added some very imaginative options throughout the synth engine. To use the modulation matrix as an example, the Vocal Filter X and Y axes are available as independent destinations. There are two sources based on the Sample & Hold output, and you can even use an audio track from your DAW as a source. Another example: you can use the voice number itself as a discrete source when in polyphonic mode, which can be a very interesting way to control a parameter. Did you ever dream of making a synthesizer talk? Well, we dreamed up a very exciting solution called the Vocal Filter. The sonic results can be spectacular, from digeridoos to interactive choirs, from sweet ‘oohs’ to the stuff of nightmares. What if the original synth had offered automation - not as a control option, but as a sound design tool? Pick up to four parameters and record realtime changes within the preset. This gives rise to an entirely new sound palette, even if only the original synth parameters are used. We added some very useful enhancements to the original synthesizer, of course - polyphony, for one thing, and many other simple and powerful features. These are easily accessed through a dedicated panel in the mini V window. Wait, polyphony? That was the dream of an entire generation of synth users! But that’s part of the beauty of software-based synthesizers, and we bring this modern capability to you with mini V.
Delay & chorus: simple parameters, but rich sound. The chorus was carefully engineered to have a "creamy" sound without blurring the natural attack transients of the synthesizer. Modulation matrix: provides up to 8 modulation routings constructed from your choice of 15 sources and 35 destinations. LFO: an extra oscillator is available for modulation purposes. This frees the third oscillator to add further depth to the sound or be available as an independent source in the modulation matrix. Arpeggiator: hold a note or chord on your keyboard and they will repeat while playing arpeggios and transposing according to the settings you select. PWM: The pulse width of any oscillator waveform can be modulated through the modulation matrix. This feature is unique to mini V, and allows you to make sounds that were impossible on the original synth. You can make an insane range of sounds with mini V. Of course it is particularly adept at bass and lead sounds. And pads. And effects. And, well, everything. But if you ask owners of the original synth what sort of sound is its specialty, almost every single one would say "Bass!" And naturally it’s used for bass and lead sounds since it is monophonic. But there’s another reason: its simple but efficient voice architecture, the specific shape of the filter, the characteristics of oscillators and the soft-clipping output stage give the original synth a warm and unique sound. And Mini V reproduces this sound exactly, so it also excels at powerful, fat basses and lead instruments. The lead sounds are also as clear and full as on the original, with the same glide and that very particular envelope response which makes each sound more playable. But there’s more! With polyphonic capability, an arpeggiator, the modulation matrix and the effects, you can make an incredible array of sounds while still enjoying the simple layout and true character of the original voice architecture. Inserting a mini V sound into your mix is quick and easy. You can pick any one of over 1,000 presets, made by renowned sound designers, and begin to play. 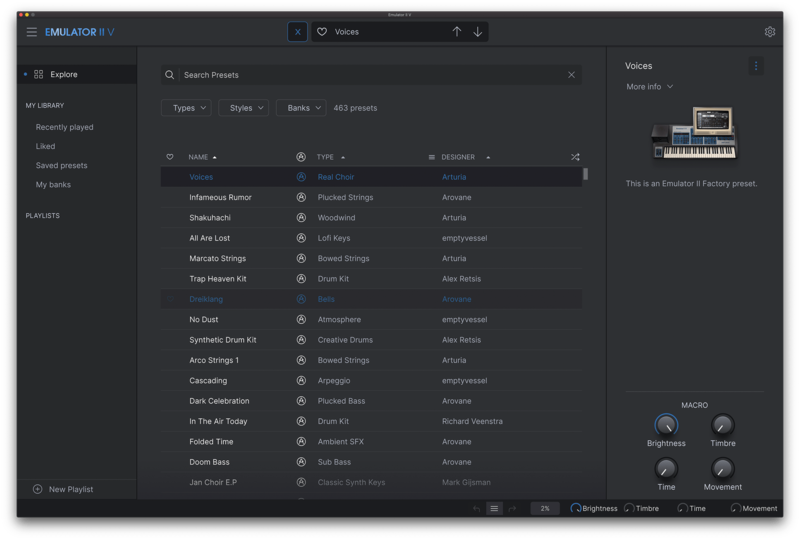 All parameters are directly accessible, so you can tweak the sound easily to fit your song. The mini V ladder filter emulation delivers a powerful and rich bass sound. Activate the Soft Clipping function for an even warmer tone. As the first portable synthesizer ever, the original synth was widely used as a lead instrument on stage. But it sounded so good that it spent a lot of studio time making lead sounds, too. Thanks to the modulation matrix, mini V can be a powerful sound design tool. It will take you to crazy sonic territories that could not be reached with the original instrument. Mini V includes an arpeggiator, which is a useful addition for real-time playability. The added polyphony and effects make it easy to create pads and textures. This was something that could only be achieved back in the day through multiple recording passes with the original instrument.